The best known but allegedly still true spring story comes from an old book about Missouri caves. Once upon a time in a little farming community in Southern Missouri, an immigrant German farmer went out to tend to his fields, passing his spring, as he did, every day. He immediately smelled and saw something that made him grin widely. He hitched up his horse and rode into to town, at high speed, announcing to passers by-- "Mein Gott, mein Gott, mein schpring, she is running beer!" It turned out that casks had broken in the local brewery, and the foamy stuff had gotten into the ground water. Not many springs run beer, or whiskey, or even lemonade as they do in song and story, but the source of spring water remained a mystery for many years. Early scientists theorized that spring water was mysteriously pumped inland from the sea, losing its saltiness by equally mysterious processes beneath the earth. In this country, folktales attributed Ozark spring water to aquifers running from the Rocky Mountains, or even more outrageously, large amounts of water which ran uphill from the Great Lakes. Other theories, especially as pertaining to "hot" springs, say large amounts of spring water are "juvenile" or newly formed water released by volcanic or tectonic processes. For the most part, these theories of spring water origin are false. 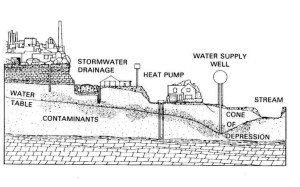 Ground water, discharged as springs, is largely recycled water--a part of the hydrologic cycle in which rain on the land falls, is stored underground, is released a surface level, and returns to the atmosphere by a variety of means, to fall as rain again. One inch of rain on one acre of ground results in 27,192 U.S. gallons of water or .0421 cubic second-feet. With an average annual rainfall of 42 inches in Missouri, each acre in the state yields an average of 1,142,064 gallons, or 1.77 cfs. Normally, a great deal of this water remains in the ground for use by plants, and runs off into surface rivers and streams. In karst, much of this runoff enters the ground, but instead of being held in the soil, it percolates directly to the bedrock layers where it either reemerges in a matter of days or weeks at springs, as surge flow or goes into long term storage, and emerges as base flow. Interaction of surge flow and base flow depends on many factors, including how much water is already in the system, and distribution of rainfall. If an underground conduit which surface water usually receives is flooded, the water has to go somewhere, and will use a different route. Because of this, delineating recharge areas can become quite complex since the water may not take the same route twice. The amount of time it takes for water to pass from the surface and out the spring affects many qualities of that water. Surge flow passes quite quickly (usually a matter of hours to weeks) and the water does not have much of a chance to settle. Particles remain in suspension, resulting in muddy or greenish colored water, which is not that different from surface water. It is during such flows that one may observe the true vulnerability of karst, since relatively large objects can be emitted from the springs under high velocity conditions. If water is underground for longer periods, a crude sort of filtering occurs. Particles drop out of suspension, as do such things as twigs, leaves, etc. The content of living organisms in the water shifts, as those which require light to survive die off, and others which do not, flourish. The water becomes clear. The process is very similar to primitive primary water treatment through settling and aeration. Just as in a water treatment plant, the water is affected by the materials it passes through. Unlike the human system, though, these materials are not controlled, but determined largely by chance. Groundwater passing below heavily used pastureland, or a manufacturing site for example, will be of a poorer quality than that below a wilderness, simply because of the concentrations of certain substances above. Mining in an area will affect groundwater quality, not usually because of the mineral being mined (which is there anyway) but because of the mixing of water levels of varying purity, and contamination by chemicals used in the ore extraction process. Other threats to groundwater quality are improperly placed septic drain fields, and the overpumping of the aquifer, which creates drawdowns, and can cause springs to go dry. 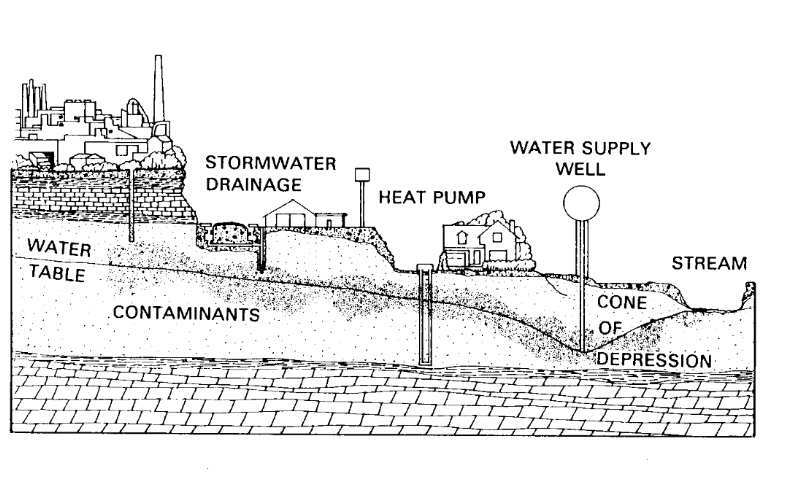 In extreme cases, subsidence or land surface collapse can result from too many wells on too little recharge. This is a problem in the American West, where irrigation and too many people in arid areas threaten the springs which drew them to the region in the first place. Austin and San Antonio, Texas atop the Edwards Acquifer are examples of this sort of misuse. 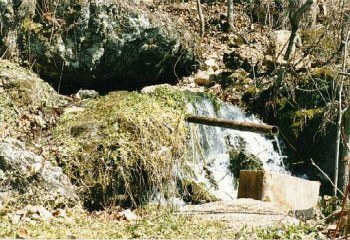 Springs and wells do occasionally go dry in the Ozarks. Extended droughts, urbanization, groundwater pollution and the improper use of land in the recharge area of springs without regard for the consequences are an increasing problem here. Much education remains to be done. A good source of additional information on groundwater issues is the Missouri Dept. of Natural Resources, both in the Division of Geology and Land Survey--Water Resources, and the Division of Environmental Quality.